Tomorrow is SUCH A FUN DAY!!! 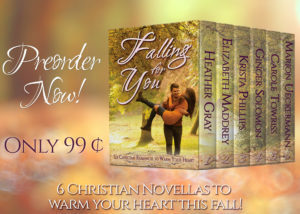 My second ever box set with a group of authors releases, Falling For You! 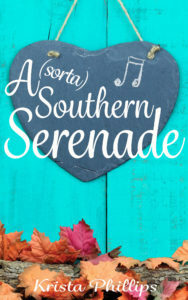 My novella, A (sorta) Southern Serenade, is featured in it! I so love this little story. I fought hard for this story because it was SO DIFFICULT for me to write, so when I finally finished it, it felt like we’d gone to battle together and finally won–the victory being a finished book! It’s set loosely in Nashville, in a suburb just south of town. It’s the first time I set a book close to where I live! It also has one other fun parallel to my life. He’s a good ol’ Southern boy. I was raised in the “North” and my hubby lived in North Carolina his whole life. Marrying into a Southern family was fun and interesting all at the same time! LOTS of “reckon”ing and “declare”ing that I’d never heard growing up! The similarities stop there though! Kendra is a trust fund baby. She’s struggling with her identity because of that, as she doesn’t need to work but still wants to feel like she’s contributing something to the world besides money. Josh grew up having to milk cows and tend chickens in order to help make sure there was food on the table. He isn’t too fond of the spoiled rich woman at first. But both have to learn to look beneath the surface and toss out stereotypes before they can find the true love that simmers just below. 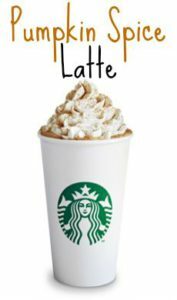 I thought I’d give you a little snippet from the beginning… and hope you check out Falling For You, 6 BRAND NEW romance novellas to help assist your Pumpkin Spice Latte’s in bringing in the fall season! She still couldn’t believe she’d purchased a house. But Nate had gone on and on about how renting was throwing away money and real estate was a good investment. And she’d fallen in love with the house. The 1970s brick ranch was old enough to have a little character but refinished with all the modern efficiencies. It was also big enough to house a small army—but she loved to cook and entertain. The kitchen—oh goodness. The kitchen had made her swoon at first sight more than any man had ever done. Quartz countertops that went on and on, a gas cooktop that begged to be cooked on, and cabinet space like she’d never seen. It was a chef’s dream. And while she was no professional, cooking had saved her a lot of money in therapy over the years. The only drawback to the house that she hadn’t taken into consideration was the large, almost acre lot and the extreme amount of work taking care of that much yard would involve. Thus—hiring the landscaping company her new neighbor had recommended after she’d received her first slap on the wrist from the HOA. The cliché was so understated it wasn’t even funny. The deep rumbling voice twirled her around. Standing right on her doorstep was the man in question, even more mouthwatering up front—except for the deep scowl on his face. Surely not. “I’m—her. I mean, Kendra. I’m Kendra Meyers.” She dumbly stuck out her hand to try and cover for her lack of coherent speech. He grasped it, his rough skin a sharp contrast to her own ultra-soft. His grip threatened to crush hers, but she gripped back, strong and steady, just like her mom had taught her. Limp handshakes are like a dead fish. Lifeless, weak, and ready to be devoured. NEVER show weakness, Kendra. Ever. Well, the man in front of her was no limp fish, that was for sure. She was almost sad to see his hand go when he took it back. “Ms. Meyers, I’m—” He tapped his pen on the clipboard he held while he stared at her. Kendra tried not to squirm under his hard perusal, but she couldn’t help but shift her weight. So yeah. They don’t have a fantastic start!! IF YOU were like Kendra (and maybe you are?? Ya never know!) and money was NO object, what would you do? Give it all away? Still work? Spend a LOT of time on the beach? Congratulations, Krista! Your story sounds great…I can’t wait to read it as well as the other novellas in the box set. Thanks for sharing an excerpt! Thanks, Jill! I hope you enjoy it!! HAHA! Me neither most likely! I’m with you though. I feel like I’d at least have to work SOME. Sounds like an interesting story. Thanks for sharing. Yeah, probably not happening at all hear either, LOL. And I agree, doing what you love is AMAZING. That’s part of Kendra’s journey, too, realizing what her box she’d marked “happiness” was void of the joy she was truly seeking, that doing what she loved was different than what she always thought that would look like! Interesting What IF question. Since I worked for over 50 years and am now retired, I am not one to sit on the beach – I volunteer, help my children, and watch my grandchildren 4 days a week. We have beautiful beaches in SW Michigan with romantic sunsets. Last night we could even see the Chicago skyline. So if I were like Kendra with money, I would still work – maybe do volunteer work for the Red Cross, a food pantry, homeless shelter. I would do random acts of kindness – pay somebody’s medical bills or utility bill with the help of an organization. Looking forward to reading the inspirational novellas in Falling For You and especially your novella A Southern Serenade. Funny, Kendra actually does a lot of that! She gives a lot of money away, but more out of guilt than out of a giving heart. There is a definite difference! I think I might give some of it way, and keep some for a trip or two, but I’d still maybe work part time just to have something to do. I’d be afraid of becoming a hermit. I need interaction with others, but I love to read and that’s what I’d do. I have four kids too, my oldest two are married and the younger two live close by but not with us anymore……Yay…..a quiet house! But I still work and I work at a middle school so I still get all the noise, smells and drama everyday!! LOVED this story, LOVED this boxed set. I was so glad to read an ARC copy and read new authors (to me). Excited to have it released tomorrow. So it lands on my Kindle tomorrow? Excellent! Ohhh, nice. I’m not sure I’d want a house ALL the time on the ocean… but a vacation house, bring it on! LOL. I’d still write too!! I might let go of a few of the other hats I carry though…. maybe…. I have already pre-ordered the boxed set. Looking forward to its appearance on my Kindle tomorrow. I really enjoyed your excerpt. If I didn’t have to work for pay I would do volunteer work and help out the less fortunate at a mission or wherever the need may be. YEAH! Hope you enjoy it!! That is a GREAT thing to do, too!! I am reminding myself today reading everyone’s responses that I should be doing that anyway, regardless of my financial status!! If I had that much money, I’d pay off our and kids mortgages, give to church and world vision, work or volunteer part time. Sounds like a fabulous plan! You had me until “Tiny Home.” LOL. I would get waaayyyyyy too claustrophobic!! An across the country road trip in a swanky RV…. THAT would be super fun!!!!! Well, the husband (brother-in-law) doesn’t love it, either, and that’s why he comes after her. I’m going to download the set in the next couple of days. Looking forward to reading it! And I realized that probably made no sense. The heroine doesn’t have a husband when SHE runs away. But the sister does. I need more sleep… :) Carry on. Best wishes! That is quite the beginning, thanks for sharing! I think if money was no object, I would still want to be doing something productive . Maybe not a full-time job, but certainly volunteering at a local charity that would keep me involved with the community. Totally with you!!! I would need something to fill my time… but would probably try to find something more flexible than a full-time job, LOL. Sounds wonderful! I ordered the book set for my birthday tomorrow! :-D If money were no object, I would definitely hire a gardener, a cleaning service and a cook! Yeah!! Hope you enjoy it!! I would take care of my bills,get an RV, , and travel the US and donate lots of money. Your book sounds fun, would love to see how Kendra and the hero work out their differences. I would pay off everything and do a lot of traveling!